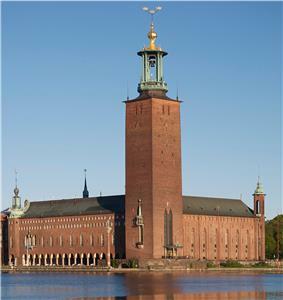 Stockholm City Hall (Swedish: Stockholms stadshus or Stadshuset locally) is the building of the Municipal Council for the City of Stockholm in Sweden. It stands on the eastern tip of Kungsholmen island, next to Riddarfjärden's northern shore and facing the islands of Riddarholmen and Södermalm. 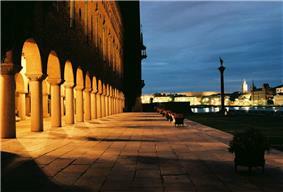 It houses offices and conference rooms as well as ceremonial halls, and the luxury restaurant Stadshuskällaren. 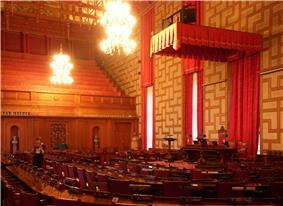 It is the venue of the Nobel Prize banquet and is one of Stockholm's major tourist attractions. In 1907 the city council decided to build a new city hall at the former site of Eldkvarn. An architectural contest was held which in the first stage resulted in the selection of drafts by Ragnar Östberg, Carl Westman, Ivar Tengbom jointly with Ernst Torulf, and Carl Bergsten. After a further competition between Westman and Östberg the latter was assigned to the construction of the City Hall, while the former was asked to construct Stockholm Court House. Östberg modified his original draft using elements of Westman's project, including the tower. During the construction period, Östberg constantly reworked his plans, resulting in the addition of the lantern on top of the tower, and the abandonment of the blue glazed tiles for the Blue Hall. 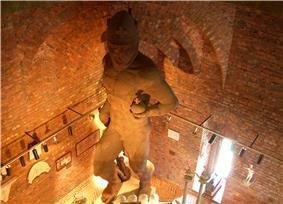 Oskar Asker was employed as construction leader and Paul Toll, of the construction company Kreuger & Toll, designed the foundations. 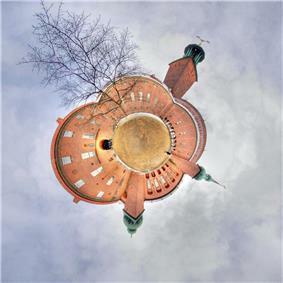 Stockholm360.net: Virtual Tour of Stockholm City Hall — with 360 x 180 degree panoramas. 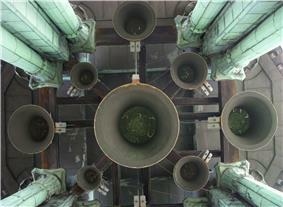 ^ Caldenby, Claes; Jöran Lindvall; Wilfried Wang (1998). 20th-Century Architecture Sweden. Munich - New York: Prestel. pp. 65–66. 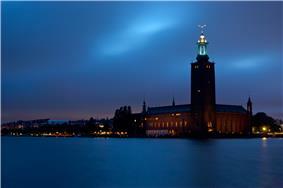 Stockholm City Hall at night. 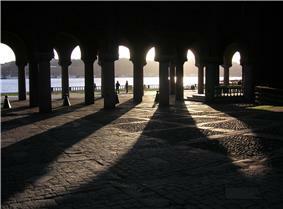 Stockholm City Hall on a summer evening. 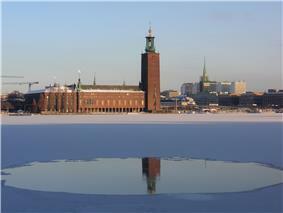 Stockholm City Hall on a winter day. The small park between the building and Lake Mälaren's shore is adorned with several sculptures, among them Carl Eldh's ensemble representing the three artists August Strindberg, Gustaf Fröding and Ernst Josephson, as well as Eldh's bronze sculptures "Sången" and "Dansen" ("The Song" and "The Dance"). 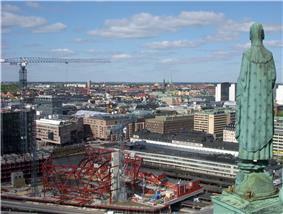 To the south-east of the City Hall, facing Riddarholmen, is a pillar roughly 20 meters tall with a statue of Engelbrekt Engelbrektsson on top. 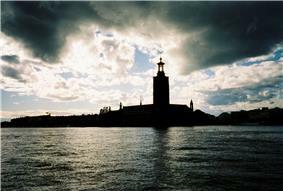 Stadshuset is considered one of Sweden's foremost examples of national romanticism in architecture. 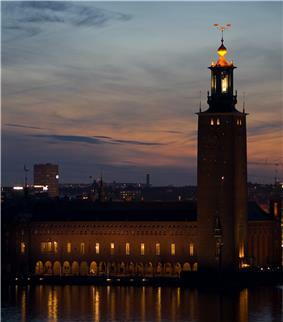 The unique site, overlooking Riddarfjärden, inspired a central motif of the construction, namely the juxtaposition of city architecture and water that also represents a central feature of Stockholm's cityscape as a whole. The architectural style is one of refined eclecticism, blending massive, austere, North European brick construction and playful elements reminiscent of oriental and venetian architecture, such as turrets adorned with golden starlets, decorated balconies, wooden masts, and statues. The Blue Hall, with its straight walls and arcades, incorporates elements of a representative courtyard. Its walls are in fact without blue decorations, but it has kept its name after Östberg's original design. It is known as the dining hall used for the banquet held after the annual Golden Hall (Gyllene Salen), named after the decorative mosaics made of more than 18 million tiles. 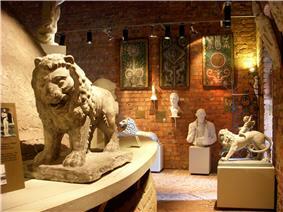 The mosaics make use of motifs from Swedish history. They were executed by the Berlin, Germany, firm of Puhl & Wagner (Gottfried Heinersdorff), after nine years of negotiations by Gottfried Heinersdorff (1883-1941) for the commission. The site, adjacent to Stadshusbron, being bordered by the streets of Hantverkargatan and Norr Mälarstrand to the north and west, and the shore of Riddarfjärden to the south and east, allowed for a spacious layout. The building follows a roughly rectangular ground plan. 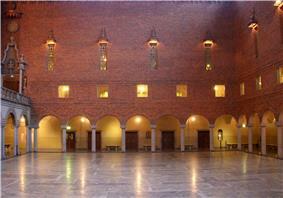 It is built around two open spaces, a piazza called Borgargården on the eastern side, and the Blue Hall (Blå hallen) to the west. 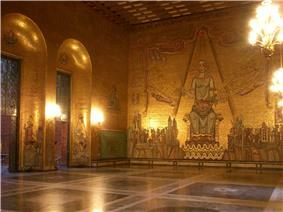 The building was inaugurated on 23 June 1923, exactly 400 years after Gustav Vasa's arrival in Stockholm. Verner von Heidenstam and Hjalmar Branting delivered the inaugurational speeches.